The man behind the signature: This portrait of John Hancock was painted by John Singleton Copley. 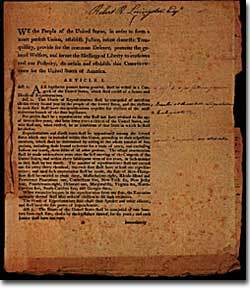 This copy of the Constitution was used by delegates to the New York ratification convention. The process in Pennsylvania, the one large early ratifier, was nothing less than corrupt. The Pennsylvania state assembly was about to have its term come to an end, and had begun to consider calling a special convention on the Constitution, even before Congress had forwarded it to the states. Antifederalists in the state assembly tried to block this move by refusing to attend the last two days of the session, since without them there would not be enough members present for the state legislature to make a binding legal decision. As a result extraordinarily coercive measures were taken to force Antifederalists to attend. Antifederalists were found at their boarding house and then dragged through the streets of Philadelphia and deposited in the Pennsylvania State House with the doors locked behind them. The presence of these Antifederalists against their will, created the required number of members to allow a special convention to be called in the state, which eventually voted 46 to 23 to accept the Constitution. 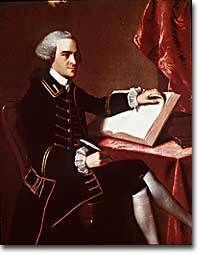 A revolutionary leader in Massachusetts, Samuel Adams founded Bowdoin College when he was governor of Massachusetts. At the time, Maine (where Bowdoin College is located) was part of Massachusetts. John Hancock might be most famous for his distinctive signature, but he was much more than some flashy penmanship. He was governor of Massachusetts during the ratification of the Constitution, and it was his change in position to support the document that helped it pass in the state. Check out this in-depth biography of Mr. Hancock to find out more about his legacy. 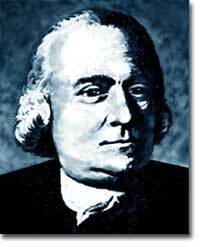 Here is a brief biography of Sam Adams, one of the more prominent Antifederalist in Massachusetts, and a signer of the Declaration of Independence. Growth of the Nation: Historical Maps of the U.S. 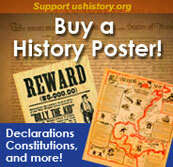 The ratification of the Constitution began a long history of U.S. expansion. As each state was admitted to the Union, the country's maps changed. Spend some good quality time with these maps of growth of America from 1775 to the present, prepared by the U.S Geological Survey. Each state debated the Constitution as drafted by the delegates in 1787. This site contains the record of all the Constitutional debates, along with The Federalist Papers and other important source documents. Want a fun way to keep track of the order that the states entered the Union? Just use the new state quarters issued by the U.S. Mint between 1999 and 2008. Each state has supplied a special design for its quarter.